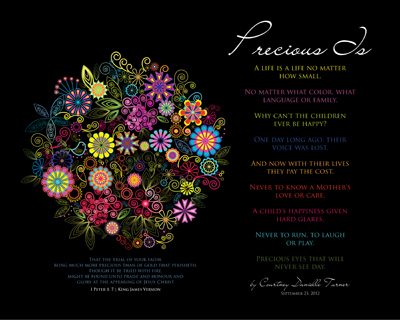 This is one of the most pointed poems that I’ve had the privilege of putting to artwork for Courtney. These words came from a very in depth discussion on a topic which should be a discussion conversation for all Christian parents with their children – abortion. 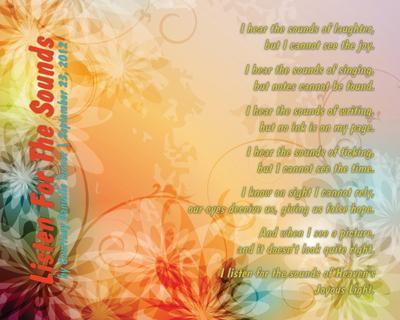 We could tell it was a deep thought provoking time – this poem is the result of how the application was made in her mind. Tough to discuss – oh yes. Required? Absolutely! This poem contains three VERY power packed sentences, which are statements conveying thoughts of the heart into words for us to ponder. 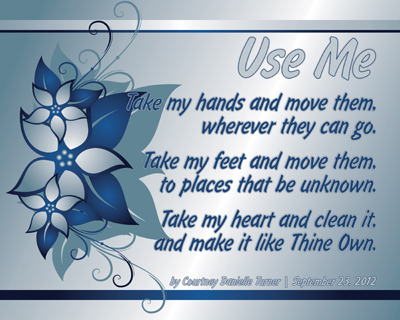 Each of the sentences begin with the words “Take my…” indicating the willingness to hand over control. Interestingly enough we each should note something VERY important – she indicates here that she wants to be used “wherever”, “places unknown” and “Thine” – each of those aspects require trusting the Master. Can we, or more appropriately “Will We” say these words – not once, but daily? There is a tall order coming from a teenager! 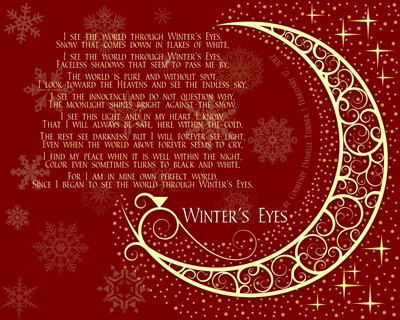 An interesting poem of perspective about snowflakes and moonlight – just ran with it in this design. Reminds me of just sitting at the window peering out when the snowflakes are falling, all quiet and still – just the motion of the flakes and the moonlight. Many times the difference between hearing and listening has been the topic of my own conversation with people, especially children. The imagery difference can be illustrated in so many different manners, which this poem does in a handful of ways. Here she uses hearing something, then the coordinating “see” to confirm what she has heard. For a few of them, the word “see” is not even used – but is understood to be “right” there. Who would have ever guessed that a “single” word is all it would take for a preacher’s Sermon to come alive in the mind of a teenager? Now we of course are talking about my daughter, who has this innate ability to slip-stream a song into another song effortlessly and DOES so quite often. Given that in our knowing, single words can be powerful launching places for us to think on Spiritual things – this poem has done just that. Even MORE special would be the trigger person who said the word as he was preaching on the day the poem was written – Preacher Randy Cox. Courtney’s third grade Sunday School teacher was Ms. MaryJo Cox, Preacher Cox’s wife. No doubt in my mind an impact made, Holy Spirit conviction exercised and the desire to have others to be Encouraged! Personally like a good Bible study that focuses on word searches, which eventually leads to phrase searches in the Word of God to reveal promises that our Creator has given to us who will trust Him, believe Him and take Him at his Word. Most of my studies involve using three things – God’s Word, a good Commentary and of course a good Dictionary. Often times it is found that what God the Father asks of us is more than just reasonable, they are VERY simple and straightforward. Then pray tell, how is it that we complicate it so??? 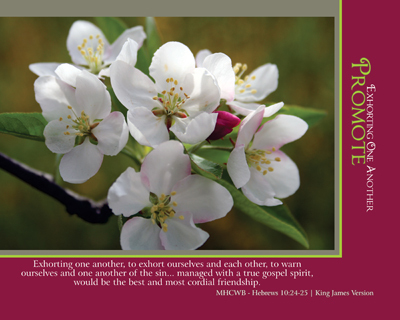 Just as in the print used here, we should be Promoting – Exhorting One Another – that means we should be encouraging one another, cheering each other on in good things, lifting each other up in those periods of bad things, in a spirit of advising to the betterment of each other. Matthew Henry had it right when he said “Exhorting one another, to exhort ourselves and each other…” The bond of friendship, kinship and brotherhood in Christ have bonds that a FAR greater reaching than the world’s definition – they stretch into Eternity in God’s Heaven! We have a Spirit that will live FOREVER – having sure the Anchor of All the Ages, Jesus Christ! Quick!!! Anyone have a pen? Something to write on… This is how most of the poems that Courtney writes become a written record – this one on a napkin as we were finishing up eating at Arby’s. 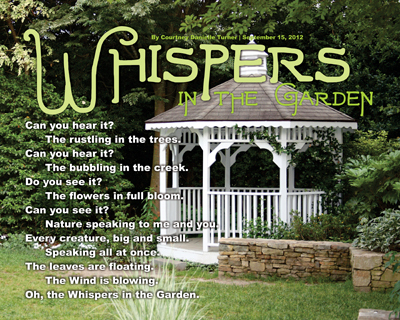 Not sure if the roast beef was doing the “talking” but she was attune to the word “whisper”, which allowed this poem to be penned. Paying attention to what is going around us, with a listening ear for what the Holy Spirit will Whisper to us requires us to both hear and see. Rarely can I recall that the call to duty was a screamer, most often in my experience it has been when a still moment of paying attention and all being cleared off of my “agenda”, when the Whisper comes. No doubt what caught my attention with this poem is the factor life is made up of Whispers indeed, if only you and I would listen for them. To realize those in need are right in front of our very eyes takes time spent with the Father in prayer, reading His Word and putting forth the desire and action to Serve our Risen Saviour. Ever thought about how strong of a relationship you have with your church family? How about YOUR Pastor??? Did things just get complicated in your mind all of a sudden? Have you noticed each of these pieces has been a question? It is on purpose and part of the consideration for the development of this Series – Get’n With It. You may think they are not connected as so strongly, but your mind just might be convinced otherwise with the following… Just as we might visualize in taking a look seeing the process of making a rope, which is made up of many strands, they then make up cords and are finally made into that three coils wrapped together to make a single rope – this analogy will make good sense. The intertwining of sting fiber strands made into eventual “rope” is MUCH stronger than the sum of the strands and cords it built using. Once the weaving begins and the rope itself is distinguishable enough as a rope, the real power of understanding can be shared and realized by all who will yield to the leading of the Holy Spirit in their lives. 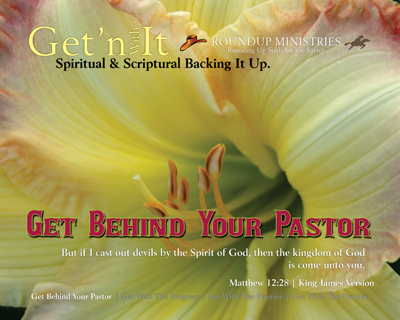 Each of the Statements presented, works hand in hand with the Things We Are To Get, and God’s Word is that FINAL Authority on what He would have us do.First of course is to “Get Behind Your Pastor”, where I can fill in – “My” for “Your” – where are we standing with the Man of God places in our local church? All the rest hinges and depends on where we are with the very first thing we are to “get” – how are we each doing? The EXCITEMENT is building as DeliverTheWord.com has slowly but surely taken off and has begun to be used by others outside of just our church here in Raleigh, North Carolina! We are Encouraged by all of the questions, sharing, Facebook likes, e-mails requesting to be added to the e-mail list and of course all the folks who have come to us to say “We didn’t know you did this stuff, when did you start?”!!! Right up to this thought today with the preparation of this issue, have had folks wanting to know what has been going through my mind in preparing this issue. Do remember this is the once a month, large issue if you will, showcase manner in which The Encouragement Chronicles highlights the goings on of things happening with DeliverTheWord.com. These editions will be a tad bit larger than the Announcing Encouragement feature which begins this week, so naturally it is going to provide everyone with a more power packed collection of things than a single announcement would include. Still of course want to make sure that just the right mix of information and updates are provided, making it an item that each of us look forward to getting every month! With this second Issue of The Encouragement Chronicles want to challenge each of us to share the Ministry of Encouragement with others. As we seek to honor, magnify and lift up the name of Jesus Christ, we need your HELP! Please consider helping us cast the net as wide as your sphere of influence. The people you influence are not going to be reached by us in or of ourselves, we don’t know who those folks are! But you do know who they are – and – you are more likely to know what area they need to be Encouraged. We’d be honored to be your On-Line Encouragement toolbox where you find what you need to keep those you know Encouraged with the Word of God! NEW Announcing Encouragement Feature | What’s NEW! Each item will be sent to your e-mail box as soon as they are released. Look for them beginning this week! Did not see the previous issue of The Encouragement Chronicles? Want to Sign Up for The Encouragement Chronicles? In looking for a Series to be the Showcase, one doesn’t have to look any further than the one that is being presented here… And He Shall Be Called… Jesus Christ! The original image used, which was given to a dear friend, utilizes a beautiful set of white daises snapped on my phone. From the very first development for the presentation of the site, support garnered from those two special people helped me understand through even the waiting to develop it from several years back was “worth it all” and the timing was JUST RIGHT! This series “And He Shall Be Called… Jesus Christ” has developed into a FANTASTIC and AMAZING project stemmed from seeing a poster a couple of years ago, named the same as this set of prints. 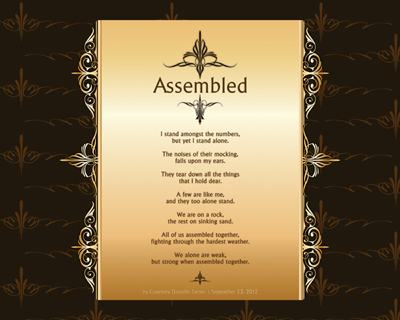 All in all there are 53 prints designed for this series to match each name pulled together for this project. All but two shots are actually from blooms from our raised flower beds at our home in Raleigh, N.orth Carolina. Out of those 53, the great majority of them (thirty five (35)) are gladiolas. Each of the prints is set to the same layout, with basic color presentations, putting forth a rich, beautiful black glossy background with two colors of gold presented by an intricate work of vines. The verse designation presented in each print is made ready in a dedicated marquee, with the appropriate Scripture verse designation. 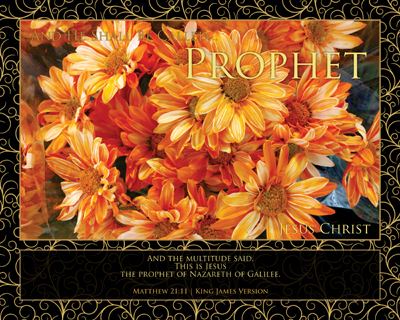 Every print has the upper left presentation of “And He Shall Be Called…” and the bottom right presentation of “Jesus Christ” inside the floating photo frame for a finished look. Just as it would be in a Red Letter Edition of the King James Version Bible, the words of our Lord and Saviour Jesus Christ are indicated in red. All other Scriptures are presented in a light gold, with the Scripture reference being made in a darker gold for each print. While attending a mens conference on a Friday evening in New Bern, North Carolina, a poster intrigued me out of the corner of my eye. Had never seen it before that time, but didn’t go over to examine it more closely until the next morning. Upon closer examination, found that each of the names of Jesus Christ had references for Scripture included in VERY small print. Pulled out my phone and proceeded to be frustrated with how the poster/print had to be worked with to get a half way decent shot of it. Decided that it might be better if it was just searched for rather than trying to get a legible shot of it. This series concept really began with the discovery of the actual poster from Inspiration Art & Scripture [Copyright 1996] (http://www.inspirationart.com/) in 2008. The poster contains the 53 names with references beginning with “Advocate“, and ending with “The Way, The Truth & The Life“. After passing the poster by a few times, then seeing it another couple of places, my attention was perked enough to do the research to find the names and Scripture references to design this set. All of the names were included in a design build a cohesive Series. Amazingly enough, most every person who has seen them in person has been able to find one that really speaks to them and they always have a story to go with it! Can a print really evoke in a person to share their testimony? For certain and AMEN! We’ve witnessed it over and over again – which NEVER gets old. While the Encouragement was meant to be for the recipient, the giver has received SO MUCH more because of the heart warming sharing. What better could be shared than sharing the Lovely name of Jesus Christ? We each should give the return to the ONE that is WORTHY – the Lamb of God. Seeing how this works??? Giving Praise winds up with one of the names in this Series! Each print has a name from the poster utilized along with the actual Scripture where the name is referenced or taken from. The flowers/blooms used in these prints are rich, bold, earth toned images which were incorporated to give a solid visual impact against the black and gold framing and lettering. The striking colors are meant to catch a persons eye such that they would be interested enough to make a change in motion and make effort to read them. The names are indeed His names, utilizing His Word, which presents Scripture to all that will read, ponder, be Encouraged and believe. Mrs. Gwen has a “flower garden” she calls it in her office at church – fantastic surprises of all kinds – which really are thank you’s for putting up with me! To the both them – Thank You! What does Jesus mean to you? What name would you share with others that is personal in your reference to the Saviour? Who is the Lord to you and me? The second of the images is the one seen here which was built around the word “reaching” utilizing an owl which takes a “little” time to tell the full story – since this is a Spotlight – will keep it short… Sent this one to to my “more senior” friend, who just happens to be a Deacon – we still haven’t figured out how that happened… He was, in a word, blown away with the image and story – he just LOVES my stories, especially when they are PAGES and PAGES of woven storytelling. It is this photo specifically which sparked his attention that I needed to let others know that this type of thing was being done. Hats off to you Bro. Steve, you’ve convinced me to be “reaching” a little past where I was, to get in on the blessing of others being encouraged! All of the presented items, references for this specific and special series are from multiple studies and sermons listened to – jotted down on trusty Post-It Notes to keep them organized. This particular set of prints was developed from selective places where words jumped off the page so to speak, which has prompted them to be called the “Selectives Series”. From the very first one developed, words like “delight”, the concept of being “selective” came upon my heart. That first reference was tied to Psalm 1:1-2 – KJV as shown in the following Scripture reference. The very idea of delighting being a more permanent pleasure than a sudden joy and not being dependent on a limited burst of excitement, was a satisfaction which I knew already, through the Salvation of my soul. Futhermore, our walk with the Lord is to be our “delight”, from which we draw all that is suppose to satisfy each area of our lives – every area of our lives should be in harmony with God’s Will for our lives. Our witness to others should show through our selection of God First in our lives! It is hoped that this list of “selectives” is one that will help each of us to yearn for the Book, one that has been prepared for us such that we would be changed more into the image of His Dear Son, Jesus Christ, the more we immerse ourselves in its hallowed pages and choose to “select” His Way over ours! Ever wonder just where your “place” is? Just as questions like “Is this your place?” as it refers to where a person might live, every one of us desires to have a place to “belong”. This WONDERFUL little set of five statements struck me immediately upon seeing them the very first time – which it is my hope they will you also. It has been some time since the opportunity has been presented to attend a service at Union Chapel FWB Church in Chocowinity, North Carolina. It is indeed the place where I accepted Jesus Christ as my Saviour and spent my freshman and sophomore years in High School. A few things have changed since our family lived around the corner from the church, one of them is the Pastor of Union Chapel. A few years back at a conference in Walkertown, was introduced to a wonderful preacher – that man is Rev. Henry Horne. Every time he comes to mind, plenty of good memories of our time there and the people we grew to love are recalled. Two of those people are Bill and Gayle Hill, who attend the same church we do now! Added to that, the “Intern” Youth Pastor/Director was none other than Rev. Jeff Jones who is the Pastor of Hilltop FWB Church. All together they are combined to make up the name of this Series – A Place for You. 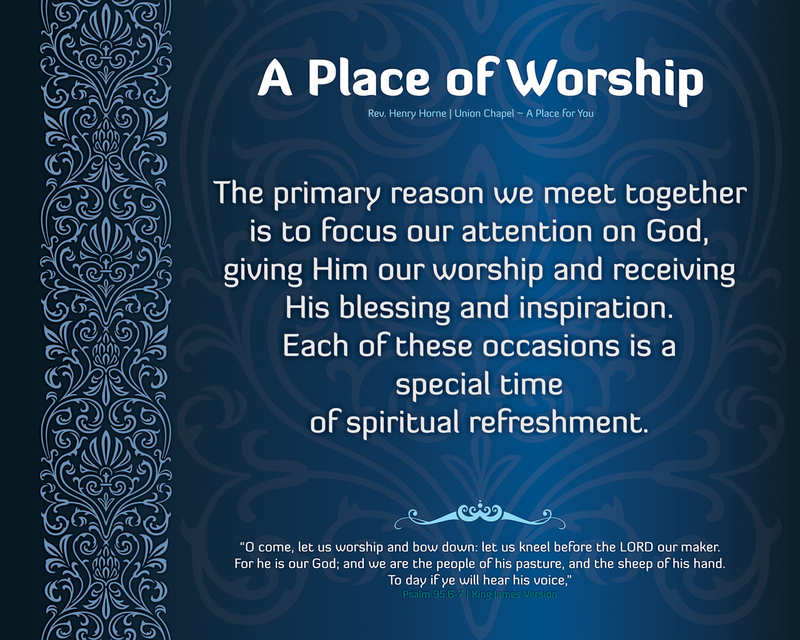 Are we actively seeking to help others understand that our local assembly of Born Again Believers is a “Place for” them? 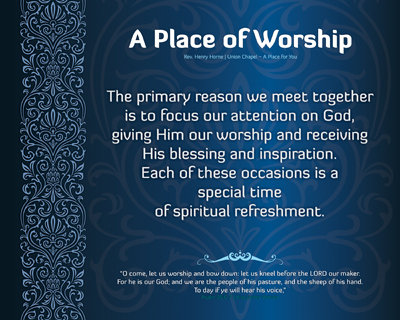 Do we tell others about our SPECIAL PLACE? Can the person sitting, standing or in the general vicinity of you and I look at your or my hopeful and joyous life, being able to tell that Holy Spirit is in control of you and me? 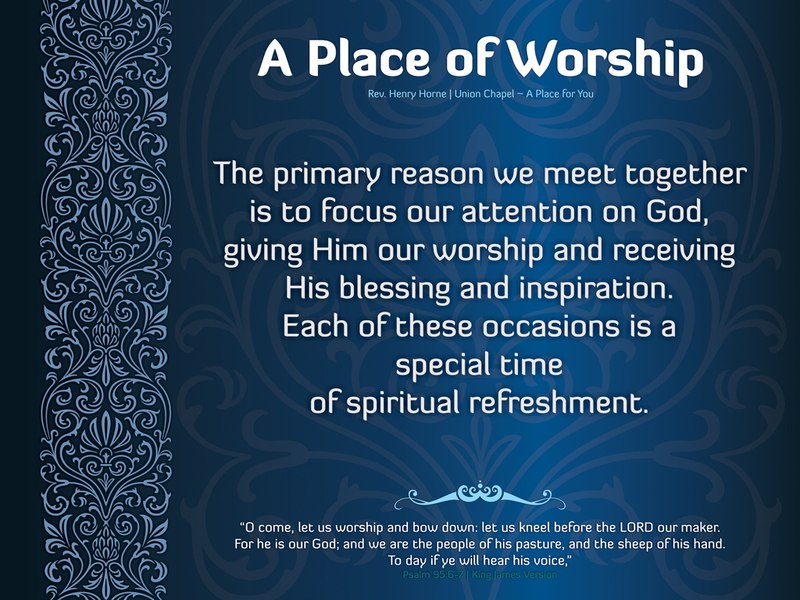 Do they have that firm invitation that says “A Place for You” is being extended because you are showing forth the Grace of the Living God to them through all that you do? Have you and I spent enough time in the Word of God to know that same invitation has been extended to us, for the LORD has for us prepared a place for Eternity with Him. We should be able to say to the Father, I’ve A Place for You – In all that we do, say, go and even think about – absolutely everywhere! Oh how many times can one be reminded that if “only” they’d listen things would be SO much better than to take the route of doing things our own way! We may think of children when recalling that phrase being said in our hearing, or it may well have been US saying it to one of our children – and of course expecting it to have the intended outcome for them, when it didn’t for us… Just getting right down to where each of us really live, but of course we have to be honest with ourselves and then get honest with God Himself, our Creator. Rules, rules, rules… Always a set of rules to go by – a listing of them in the Scriptures are called Commandments. They could also considered laws when they are thought of in the context of society as a whole. They also, as mentioned in the first paragraph, probably come to our minds first in dealing with children, as they tend to come with consequences for actions either taken or not taken as expected. Here comes the tipping point with this whole challenging Series, WILL we, WILL I, WILL you LOVE (truly LOVE) the Lord OUR God with ALL? Everything? The Father wants ALL of us, not just a part of us – but there is someone else who would like to “have” us TOO!!! 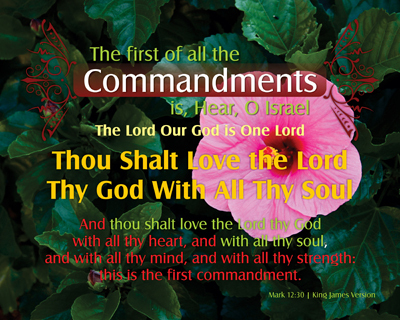 The words to Scripture referenced in this print are in RED because it is the Lord Jesus talking – HE says that we have to “love the Lord thy God” with ALL thy HEART, SOUL, MIND, STRENGTH – all FOUR of those things – that is the FIRST Commandment. 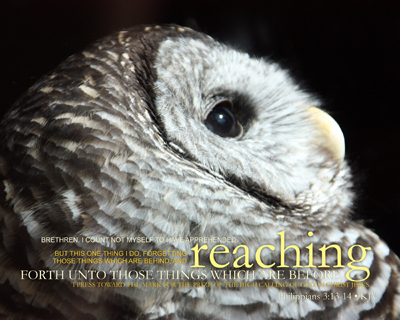 Displayed this print (#4) in the Series because it is our SOUL which is up for capture and has an Eternal destination. It serves to remind me of my Salvation! What will we decide to do with our love? Spending a few days with one chapter in the Bible, especially one with only thirteen (13) verses, will change a person, that is if we will let it. 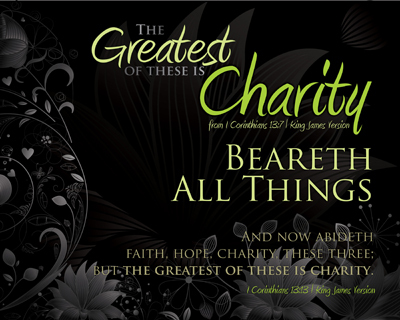 The specific chapter of Scripture being referred to is I Corinthians 13 – it is the Chapter in the Word of God concerning Charity. When is the last time we might have said “whatsoever” in the common manner or way of speaking? We might be more able to remember the little colloquialism of teens of “whatever” in a string of words, which leaves out the middle word of two letters of “so”… A phrase that comes to mind is “Whatever comes comes, or whatever happens happens…” That thought is presented forth is just looking at what is there and saying it is so, with no determination to make a distinction of what might be if a choice had been made of something different. 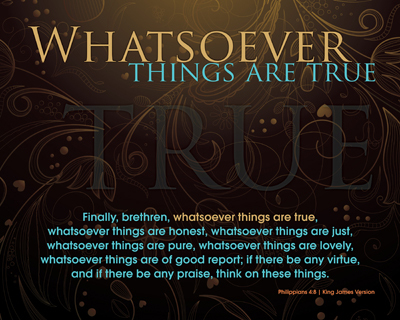 That spoken or written word assumes that “whatever happens” is something that we have no choice in choosing. I’d beg to differ, in a MOST profound manner! 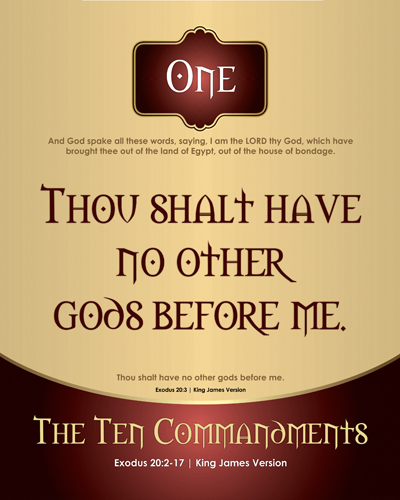 For quite a while now have wanted to put together a Ten Commandments theme and set of prints. It seemed innocent enough, most folks I thought knew them or at least of them because of the “hot topic” they have become in the public eye because of news coverage. Along with that thought was the recall that we had to recite them in a children’s play when I was in the first grade. Further added to that was the remembrance of having those taught in Vacation Bible School, shared in Boy/Girl Scouts and having seen them in many places where honor, upright service and civic duty were commonly given top consideration. Do you remember those things along with me? Fast forward to today… My struggle to complete them has had nothing to do with me getting my hands, heart or mind around them, rather it has been a confrontation of a different nature – understanding why they would even need to be put into a Series to begin with. Looking around – it is as if they have vanished right before our very eyes. Where is the last place you’ve seen or I’ve seen them in prominent display?